To advance the understanding and practice of management through rigorous thought leadership. Simon Business School (formerly known as the William E. Simon Graduate School of Business Administration) is the business school of the University of Rochester. 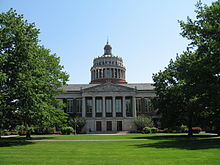 It is located on the University's River Campus in Rochester, New York. It was renamed after William E. Simon (1927–2000), the 63rd United States Secretary of the Treasury, in 1986. The school's present dean is Andrew S. Ainslie. Simon Business School offers full-time, part-time, and executive (based in either Rochester or Switzerland) Master of Business Administration (M.B.A.) Programs, as well as Master of Science (M.S.) Programs. The school is home to substantial academic research enterprises and to a Ph.D. Program in several business disciplines. The University of Rochester started as a small business program in 1958, and awarded its first M.B.A. degree in 1962, but the School's impact in the business world can really be traced to a later decision by then University President W. Allen Wallis to create a first-class business school in Rochester. In 1964, he was recruited as dean. Dean Wallis believed in the power of economics to solve a host of problems. William H. Meckling—who would remain dean for 19 years—was a noted economist best known for his analysis and leadership in support of an all-volunteer U.S. armed service. As dean, he committed the school to an economics-based approach to problem solving, recruited a leading faculty, required that all research at the school have an empirical orientation, initiated new finance and accounting journals that incorporated economics, eliminated traditional boundaries between functional departments, and transformed what had been a small, undergraduate and evening business school into a leading graduate business program. As a result of work by Meckling and Michael C. Jensen—one of the faculty members he recruited—and other faculty members, the Simon became known for its contributions to the areas of finance, accounting, and organizational theory. The faculty's contributions, in turn, helped shape the research agenda of a generation of business scholars around the world, influencing teaching in graduate business programs and changing how many companies and executives in the US and abroad conduct business. In 1986, another milestone in the school's history occurred when the school was renamed the William E. Simon Graduate School of Business Administration. William E. Simon, a financial entrepreneur and former U.S. Treasury Secretary, believed strongly in the principles and ideals of the school. He offered his name and an enduring financial commitment to the school's continued success. He chaired the Executive Advisory Committee from its inception in 1986 until his death in June 2000. Today, Andrew S. Ainslie—who succeeded Mark A. Zupan in 2014—serves as dean of Simon Business School. The Full-Time Master of Business Administration (M.B.A.) Program is the flagship two-year program and begins in August. With an average full-time M.B.A. enrollment of 100 students per class, the Full-time M.B.A. program is roughly 50 percent international. The Full-Time M.B.A. degree requires 67 hours of study, consisting of a total of 20 classes (9 core required courses and 11 electives) and an additional 3-credit course on Business Communication and Career Success. Full-time students complete the M.B.A. course requirements in six academic quarters of varying lengths with an internship in the summer between the first and second years of study. The first year of the Full-Time M.B.A. Program is divided into three quarters (Fall, Winter, and Spring), followed by a summer-long internship. During each of the first three quarters students are assigned to teams of four-to-five students. During the second year, which consists entirely of electives that allow students to focus on their preferred concentrations, students form their own teams. The full-time M.B.A program is among the top 50 in the U.S., as rated by several prestigious publications. Simon is among the top 150 business schools in the world, according to Times Higher Education. Simon's Part-Time Professional M.B.A. Program offers the same educational opportunities and choices for a concentration as the Full-Time M.B.A. Program, but through evening courses, tailored for individuals who are working while completing the degree. The program delivers a cohort-style experience for core courses, with assigned study teams, support services, and scholarships to support the accelerated timeline. The program begins each September (Fall) or March (Spring), with students taking two courses per quarter and completing the program in 2.5 academic years. Simon's Executive M.B.A. program is offered on the Rochester campus, as well as in Bern, Switzerland, in conjunction with the Institut für Finanzmanagement at the Universität Bern. The Bern program is equivalent to the Rochester program and is taught by Simon School faculty and European scholars. Students are typically sponsored by their organizations and earn a University of Rochester degree. Like Rochester's Executive M.B.A. students, the students of the Rochester-Bern Executive M.B.A. program in Switzerland come from a wide variety of countries and cultures. Bern students spend their four-week summer term in Rochester studying alongside American students. Simon Master of Science (M.S.) Programs generally only require one year of full-time study. Students also have the opportunity to take some classes with M.B.A. candidates, work on multicultural teams, and participate in a variety of extracurricular activities. The school offers M.S. programs in Accountancy, Business Analytics, Finance, Health Care Management, Management, Marketing Analytics, and Medical Management. The University of Rochester's Hajim School of Engineering and Applied Sciences also offers a Master of Technical Entrepreneurship and Management (T.E.A.M.) Program, with some courses completed at Simon Business School. The M.S. in Health Care Management curriculum is designed for working professionals who want to develop the skills to better evaluate their organizations, optimize care delivery, and prepare for the next round of fundamental industry change. The program consists of six core courses from the Simon M.B.A. curriculum and six health care courses covering key topics such as industry structure and reform, financing, insurance, operations, information technology, and investments. At the end of the program, a Medical Entrepreneurship Business Plan Project lets study teams apply their knowledge to a real-world situation selected by team members with faculty guidance. Typical projects include developing business plans for new or existing services, and identifying opportunities to improve clinical quality and efficiency. The residency weeks—Orientation and FACt Workshop, and Special Topics in Finance, both held in Rochester, NY—offer students the opportunity to immerse themselves even more deeply into the subject matter. During residency weeks, students work closely with Simon professors, meet guest lecturers, and network with each other and Simon alumni to round out their graduate education. Simon's Master of Science degree in New York City is a 13-month program that begins in July. Simon Business School's NYC home is located at 185 W. Broadway in the Tribeca area of lower Manhattan. Simon's facility at New York Law School provides direct access to Wall Street, the City's civic center, and tech corridor. This is the only co-located law school and business school under one roof in New York City. Introduced in 1965, Simon Business School offers an extensive Ph.D. program with a variety of concentrations. The most common majors are Accounting, Finance, Marketing, Computer Information Systems, and Operations Management. Regardless of the major, all students' first-year studies include a core program designed to build a firm foundation of mathematics, statistics, and economics. While the majority of the courses are taken in common by all the incoming students, there is some specialization. This specialization gets more intense in the second year when the students concentrate on their major and minor fields of study. A majority of Simon's Ph.D. graduates attain academic positions in top business schools, with 20 percent getting their first job in a top-10 ranked business school. Arunas A. Chesonis - Chief Executive Officer (CEO) and Chairman of the Board, Sweetwater Energy; Former Chairman of the Board and CEO, PAETEC Holding Corp.
Colleen J. Wegman - President and CEO, Wegmans Food Markets, Inc.
Several innovations in business economics were developed by faculty at the school, including advances to agency theory and positive accounting theory. The school is also home to three academic journals in management: the Journal of Accounting and Economics, the Journal of Financial Economics, and the Journal of Monetary Economics. ^ "World University Rankings by subject: business and economics". Times Higher Education. 2016. Retrieved 2016-10-29. ^ "Best Global Universities for Economics and Business". U.S. News & World Report. 2017. Retrieved 2017-03-15. ^ "Global MBA Ranking". Financial Times. 2019. Retrieved 2019-01-31.